A fresh and vibrant new approach to legal and effective hiring. 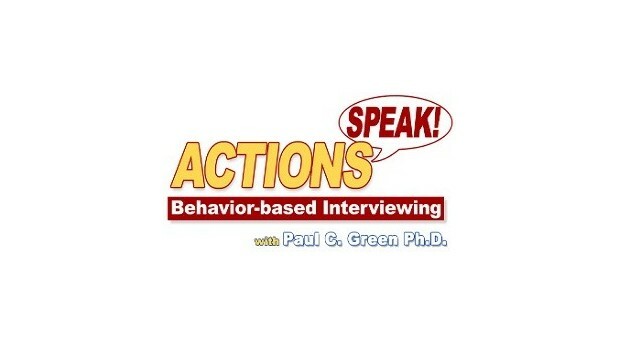 Author, Dr. Paul C. Green and Producer/Director, Art Bauer, have re-teamed to produce a fresh and entertaining approach to behavior based interviewing. Based on the time-tested truth, "Past actions predict future performance," this new high-end production combines the elements of memorable storytelling, practical content and realistic acting to weave together a highly effective training course for a new generation of interviewers. The story takes place in broadcast television studio during rehearsals for a weekly business news program. The host of the program has invited a special guest to help her review a new business book on employee interviewing techniques. As they begin to critique real world examples of interviews, the invited guest is less than helpful and decides to share his own strong opinions on the subject.